The opportunity is here, it is now, and it is ours to take. As The Legal Genealogist said in Friday’s presentation to the National Genealogical Society conference in Richmond, an ad hoc group of the best and brightest of the genetic genealogy community has been engaged for months in the process of developing ethical standards for our field. Those of us who knew this was coming expected it by summer — and it’s happened faster than we expected! Led by people like Blaine T. Bettinger, a lawyer, genetic genealogist and author of The Genetic Genealogist blog, and CeCe Moore, a genetic genealogist and author of Your Genetic Genealogist blog, the group includes representatives of the genetic genealogy community, the forensic genealogy community, scientists and traditional genealogists, and has sought wide input from as many different viewpoints as possible. Now it’s time for us all to have our say. • and, perhaps most importantly, where might we see an issue that the committee hasn’t yet addressed? The draft — which may only be downloaded for your own use, and not copied or redistributed to others — can be reviewed at a site set up by the committee: Genetic Genealogy Standards. Although the title says the draft is available for comment from May 15 through June 15, it is available now. There’s a link at the left for the Document, and another link for Comment. The comment area may look small when you open that page, but you can write your comments offline and paste them into that box, and it’ll accept them as long as you’re not writing a tome the size of War and Peace. The draft covers ethical standards for the use of genetic genealogy test results ranging from issues of consent to scholarship, and standards for the interpretation of genetic genealogy test results ranging from the different types of tests to a “to-be-arranged” entry for citing DNA test results. Think about how you’ve used DNA testing … and how you want it to be used, now and in the future. Together, we can make sure this opportunity is not missed. In my opinion, the ethical issues involved in genetic testing are much broader than those discussed in this draft document. What of untested family members? The living siblings, parents, children, grandchildren, aunts, uncles, nieces, nephews, and cousins of those who are tested and granting consent? It seems to me that ethical issues at the intersection of Unexpected Results and Sharing may be problematic for some families. An analogy might be to a group photo of living family members. If one person in the group gives consent for public posting or publication of that image, would that be enough? What of the others? After all, it’s an image of them as well. As an ethical matter, do they not have the right to decide when, where, and how it is revealed? However, to use your analogy, depending on the place the photo was taken and the circumstances of publication, it might not be necessary to have anyone’s consent to post a photo in public. That’s a bridge we as a society have already crossed — and long ago, at least as a matter of law. Ethically though, I think Aunt Susie gets to decide if she’s unhappy that her bra’s showing, and doesn’t want that particular image published in the community newsletter. Cousin Ed gets to say he doesn’t want pictures of his newborn off the web. Etc. Even if it’s legal, sharing personal photos and information can still be wrong, on a spectrum of behavior ranging from the mildly inconsiderate to the overtly cruel. Yes, there is all too often a clear distinction between what’s legal… and what’s right. Having just experienced,seven months ago, a HUGE Unexpected Event in my family which revealed a sister I had never heard even a whisper about, my feeling is that each member of the family has to deal with those things in his/her own way. I was the person contacted about the existence of this “new” sister. In less than 24 hours after I received the information, and had spent some time trying to verify it, I called each of my other three sisters and told them about the new information. I also told them that I was going to embrace this new family member and it was up to each of them how they would handle it. My family is widely scattered and I don’t even know how to reach some of them, so I would never be able to move forward if I had to contact all of them. When I had my DNA done, I figured it was my business and I didn’t talk to anyone about it. Family members all take photos and put them in albums and show them to whoever they wish without asking me if I want to exercise my “right” to disallow distribution of photos which include me. Yes, DNA testing may reveal “secrets” on a different level than photos but life isn’t always what we wish it was. I’d rather know the truth than live without knowing what the realities are. That said, I do know a couple of things about an aunt which I would never reveal to her children because I know it would be hurtful to them, and it isn’t significant enough to do that to them. Just for clarity, no DNA testing was involved in the revelation of my “new” sister. I just think that there need to be ethical standards but there also have to be limits to how many people we must get permission from before we make a move. I agree that we need to balance our desire to share information with our desire to respect privacy — and have our own respected. But the balance can’t be so far tilted towards privacy that someone else has a veto right over our own testing and research. Judy, that’s exactly what I was trying to say but you say it so much more clearly. For clarification, I’d like to reiterate that my comments about ethics and family members relate to “public posting or publication”. Private conversations between family members, and photo albums shared with others in the privacy of one’s home, are not what I consider to be public sharing. In contrast, a public revelation about your previously unknown sister would have been writing about it for submission to your community newspaper or alumni magazine, or posting about it on a public website with real names given. But these days so many people are posting older family photos, as well as current ones, that it can easily appear in a public forum and I’m fairly certain that most of the people doing the posting don’t ask permission. It’s really a difficult balance between protecting the privacy of others and doing something which you think is harmless and which helps you advance your search or is just something that you want to share. Alice – thank you for reviewing the document and submitting the comment! We’ve been getting many great comments over the past day, it’s great to see the community so interested and involved. You raise excellent points, and difficult ones at that. Do you think that untested family members should be asked before their relative takes a DNA test? Or just before they share the results? How far within the family would you extend the concern? Should a company require consent from family members before providing testing? I would appreciate any suggestions you have about how to resolve these issues, as this is ultimately one of the goals of this committee. Regarding the analogy, I raise one point and would like to see what you think. Sharing a picture is sharing an exact image of an individual. In contrast, testing a brother or mother is, for example, only looking at a random 50%, which may or may not reveal anything about the individual. A grandparent, cousin, etc., is 25% or less. Does this change the issue at all? Thank you again, these types of conversations are exactly what are needed! To me, “private”, in this context, means: Not publicly searchable on the Internet or within the testing company’s website, not published in any way unless it is done with complete anonymity, and not linked to/posted to/attached to a public tree on Ancestry or any other site. A: If the results can be kept private, I don’t think asking untested family members is ethically necessary. However, I absolutely do think it is ethically wrong to share genetic results in a non-private way, unless all living close members have consented to the sharing. A: Yes, it does change the issue, and eases concern considerably – depending on whatever the DNA results show. In the draft example, you mention misattributed parentage. That’s not a percentage thing, it’s an either/or straight down the descendants list thing. So “how far within the family” I’m concerned depends on what is revealed, and whom it may/may not effect, and why. It would be a case-by-case issue for me, ethically. A: No, because I think folks should have the right to test their own DNA for their own private knowledge. Ethically, I don’t think the non-testing relatives should have a right to deny that. Your constraints make DNA testing essentially unworkable for genealogical purposes. I need to be able to interact with my matches to be able to determine just what my DNA shows about my heritage. If I can’t do that — if a match can’t find me — if I can only work “with complete anonymity” — then the test itself does me no good. I think that’s carrying the concept of privacy way too far since it allows a relative to hold my information and my ability to use my information hostage because of an outside chance of some impact on that relative. Is it not possible to interact with your matches in a private way? If my brother takes a Y-DNA test as Subject ABC123, and your brother takes it as Subject DEF456, and the results match, can’t the testing company then put them in touch with one another in a non-public way? The model you’re suggesting just postpones the ethical dilemma that you want to allow some relative the right to say you can or can’t share genealogical data. Sure, the company can force two matches to deal with each other only by way of internal email. 23andMe does that now. But at some point you and your match have to make disclosures about your respective genealogies or the whole testing process and the dollars you’ve invested in it are worthless. Judy, we don’t seem to understanding one another here. If our brothers disclose genealogical info to one another privately, I don’t think that counts as publishing (as I would define the word). Of course, sharing the information privately means that the match may turn around and make it public, even in violation of a request not to do so. That’s a risk one takes with any private sharing, certainly. Alice, part of the issue is your definition of private. If something isn’t even searchable within the testing company’s website, on the outside chance that some other family member might be offended, I have a problem with that. I have no problem agreeing to disagree here! Please know that I am not arguing, but simply trying to understand your view. I’m wondering why pseudonymous searching with the subsequent private exchange of genealogical information between matches doesn’t work for you. Would you mind explaining? There is a real risk of data loss involved in always locking things away and insisting that someone today expressly agree (again) to share it even though that person signed a consent form in the past. DNA testing is a long-term proposition. Critical matches may not appear for years, especially in those of our ancestral lines where we’re still searching for living cousin-candidates who might be willing to test. If no information is available on the testing company website, and the original test-taker match is deceased, his or her genealogical data may be lost even though he or she would have willingly shared it if still alive. By contrast, the net gain in privacy protection is minimal, given that the vast majority of information accessible on the testing company websites is utterly benign. Thank you for explaining. The risk of data loss is definitely a valid concern. I wonder how many people refuse testing because of concerns over privacy issues? That’s the flip side of this issue, I suppose. The risk of data never even being gathered in the first place. We’ve all had experiences of cousins refusing to test, but that at least is their personal decision. It’s the notion of having someone else make the decision for me (“no, you can’t share because maybe somehow it might reveal something about someone else”) that bothers me. I certainly agree that someone telling you not to share at all – not even privately with your matches – would be way out of line. On the other hand, a close relative asking me to only share DNA results in a private manner (pending analysis of the results) doesn’t seem unreasonable and doesn’t bother me at all. And where do we draw the line? Would you allow a known full blood sibling to veto your decision to post your own results? How about a cousin? An aunt or uncle? I would certainly listen to any of these people if they could articulate a specific reason personal to them for not wanting my results known. But I would not tailor the entire DNA testing system to protect unreasonable sensitivities of a few, and would not grant anyone veto authority over any results except his or her own. With regard to *public* posting, yes, I would allow a veto by a parent or sibling, until they died or changed their mind on the issue. With regard to the private exchange of results among matches, no. I would not allow such a veto. With regard to cousins and aunts/uncles, it depends. If it were y-DNA testing, then yes, I would allow living folks along the shared male line to veto *public* posting of results. With other types of testing, it would depend on why they were concerned. As for tailoring the entire DNA testing system, that is a legal/regulatory issue, isn’t it? I am talking about ethics, a personal code of conduct, here. You ask where “we” draw the line, but I don’t see a “we” here. This is a personal decision, related to family dynamics and varying circumstances, histories, etc. Each of us will have to choose our own comfort level, yes. But we need to take care that our own personal decisions don’t end up driving the bus for others who don’t see things the same way. Of course, I submitted my own comments before seeing the discussion here. My initial thoughts are below, but as some of my concerns are being addressed here, I’ll chime in directly once I look through the thread. Thanks! The standards are a great first step, and I appreciate the hard work that went into this draft. However, I think there could be some improvements before the standards are released. Some of the provisions expressly refer to ethical duties of the genealogist to the test-taker, but other provisions refer only to the genealogist. For example, items 3, 5, 6, 7, 8 and 9 might be improved by clarifying that the genealogist should inform the test-taker of the issues regarding access, storage, beneficiaries, unexpected results, terms of service, and health information or refer them to such information before consent to test is obtained. Similarly, items 5 and 6 refer to issues that, ethically, the test-taker ought to be given the opportunity to decide. Item 8 should also be amended to address situations where the genealogist purchases the test, as in such situations the test-taker may not be aware of the terms and conditions. Finally, in item 11, I believe it would be more appropriate to limit the item regarding privatization or redaction to living matches, and the consent sought should be the test-taker’s, not the genetic matches. It may be debatable whether or not living matches also should be asked for consent, but at least that should only be even considered if the test-taker has given their consent to make such contact. Love the collaboration for the standards! 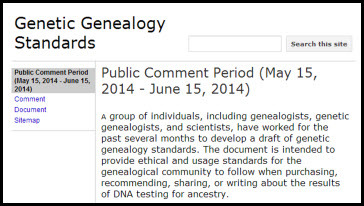 The time you all took to help promote best practices in genealogy is much appreciated. One thing I haven’t seen mentioned in THIS discussion is that if you submit your DNA for testing, is it not implied that you are giving consent for it to be shared with the others in that database? Are you not consenting to be contacted by others in your family tree, even members you did not expect? And did the others not also consent to be connected to others? There are numerous ways to get your DNA tested, not all of them need to be put into a database, albeit private DNA tests are most likely far more expensive. If you submit your DNA to an organization like Ancestry, I believe that consent is implied by the vary nature of the purpose of the test. Should you ethically go willy-nilly and contact others outside of the other testees who have also consented by implication to be contacted, such as a relative of the testee? I don’t think that would be ethical, but certainly I don’t think contact or sharing of genealogical information between testees is either unethical or illegal? Judy, please correct me if I’m wrong on that. I am working on an adoption case right now. Some years ago, the biological mother was contacted by the adoptee. While she was upset at being contacted, she stayed on the phone with my client for 15 minutes. I do believe that is actually quite a long time to be on the phone. The mother indicated that she did not want to initiate a relationship with my client at that time, but might in the future. This was before I was contacted and hired. My client would love to get to know the biological mother better, but respects her privacy. My client needs to know the medical history of the biological family because of health issues. I believe privacy laws and standards have been in place for some time on this issue. Judy, please do chime in here. I will also be checking with my local family lawyer in my BNI group, but I’d love some feedback on a more global scale as well. And as with any family member who is being communicated with for the first time, you must respect their wishes if they choose not to respond to you or ask you not to contact them again. How many family feuds are going on right now in just the U.S., not to mention the world? Family members don’t want to talk to one another or respond to inquiries. You have to respect that. You can always ask if someone is willing to communicate with you if you ask respectfully, and establish in the communication that you will abide by their wishes. Maybe I’m way off base here, the above are my own personal reflections and not that of any other person or entity. There is an express (in some cases) or implied (in others) consent to be contacted by your matches if you provide contact information. And no, I do not believe it is unethical and it certainly isn’t illegal to share genealogical information about yourself and your ancestors. The line in my opinion gets drawn when you’re dealing with living people who are directly impacted by a DNA-related disclosure. The issue (as I see it) is not the ability to contact or be contacted. Rather, the issue is public disclosure of information that is not otherwise available to the public at large. On Ancestry’s Facebook page, public-tree members frequently complain about private-tree members who show up as DNA matches but don’t freely share family tree information unless asked privately. The private-tree members may still share genealogical information with their DNA matches. But they choose to share it privately. So after reading through the previous discussion, my $0.02 is that the if the genealogist obtains the consent of the test-taker, and privatizes living matches, public disclosure of the rest feels ethically OK to me. I think that strikes a decent balance, especially as the test-taker would be free to share everything if they wanted to do so. Now if you want to publicly disclose living matches, that raises a bit more of a conundrum. My personal view is that the test-taker’s consent to such disclosure is sufficient to permit a genealogist from ethically making such disclosure, but others may not agree. Should the standards mandate more than the consent of the test-taker? Perhaps a statement that the genealogist should discuss potential sensitivities regarding public disclosure of living matches with the test-taker before obtaining the test-taker’s consent to such disclosure? The concept of informed consent is a good one, I think; if the genealogist discloses the issues to the test-taker, and then the test-taker provides consent, I think that satisfies the genealogist’s ethical duties. More to the point, I don’t think it should be considered an ethical breach to not secure consent of all living matches in such a circumstance, and that would be impractical anyhow as others have noted. One other potential clarification- is it worth noting that when the genealogist IS the test-taker, no further disclosure or consent is necessary? As an adoptee/genealogist, I would want it to be perfectly clear that I can ethically do what I wish with my own test results. Again, thanks to the committee for all their work on this, especially in view of the strongly-held feelings many have regarding some of these issues. Please be sure to submit comments through the official website as well so that they can be considered by the committee (I received your first set, but I don’t think you’ve submitted this update). It’s not clear from your comments what you’re getting permission/consent to do. What disclosure are you doing with the results? And at this point, I think it’s safe to assume that all DNA test results are “living matches” since there’s been very little time for test-takers to die. Some have, but it will be a tiny percentage. I agree that you have the right to do what you want with your own results as either the test-taker or genealogist, but you don’t have the right (in my opinion) to share information about your own genetic matches without their consent. For example, when I give presentations, I use my own results. I intentionally redact identifying information about my matches unless I’ve specifically asked them for permission. I realize that there’s an incredibly small likelihood of harm, but it is (again, in my opinion) the safest approach. Perhaps we’re on the same page here? Looking forward to your thoughts (and your feedback submission!). Thanks for another informative article, Judy. I’ve also enjoyed the comments and conversation. My only concern is the effort being put into something that is not legally binding. Tim, remember that it’s pretty easy for one of your matches to have his or her email contacts list swiped by a hacker and that’s why you’re getting the spam. It really isn’t anything FTDNA has done — it’s the lack of security in some email systems and programs.